I have not been very active, due to the nature of a recent job posting, but now that I am back in the public sector, it is time to start at it. 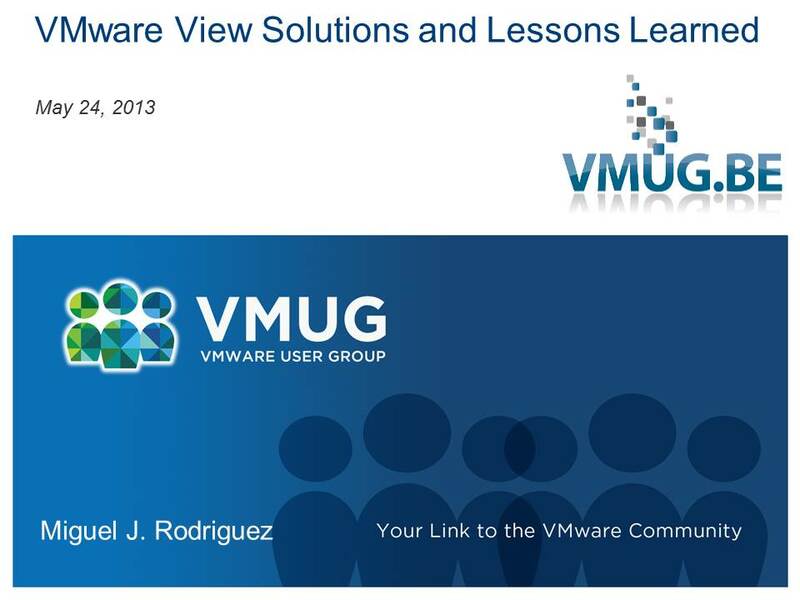 This attached presentation is from the VMUG Belgium meeting in May of 2013, where I was honored to give a bit of information and tidbits on a VMware View implementation use case. Another victorious day after finding out that 64 bit MS Office 2010 applications are not supported in the ThinApp process, As per the KB article, you have to capture the MS 2010 Office apps in a 32 bit OS. Fortunately, we did have access to the 32 bit apps, captured them on a 32 bit Win7 OS and packaged them to my 64 bit Win 7 linked clones. Specifically we are talking about MS Project and Visio porting to the linked clones with 64 bit MS Office. Seems to work well. You know, there is much more to designing a vDesktop solution that a server virtualization gig. I am not saying server virtualization is easy, but a vDesktop solution is a thinking man’s game. There are a lot of moving parts to it, and there are a mass of things to consider and plan for during the design. During a conversation with my co-workers, the discussion was that we should not be responsible for the end to end solution. I have to disagree with that train of thought. As a consultant or engineer, I need to be concerned with the total solution, from end to end. That is what can develop you into a good consultant, engineer and trusted adviser, plus the experience is HUGE!!!! More to follow on our experiences. This is great stuff! If you need a quick primer on VMware View, you must read VMware View 5 Desktop Virtualization Solutions, by Written by VMware experts Jason Langone and Andre Leibovici, as well as Building End-User Computing Solutions with VMware View, by Mike Laverick and Barry Coombs. The two books, plus the VMware View pdfs have been an immense help in getting our project off the ground. As the Lead on the View implementation, I had to get smart on View quickly, and these two publications have saved the day. Must reads!!! Also waiting on VMware View 5: Building a Successful Virtual Desktop. Symantec and VMware View 5.1 Integration….It works!! !